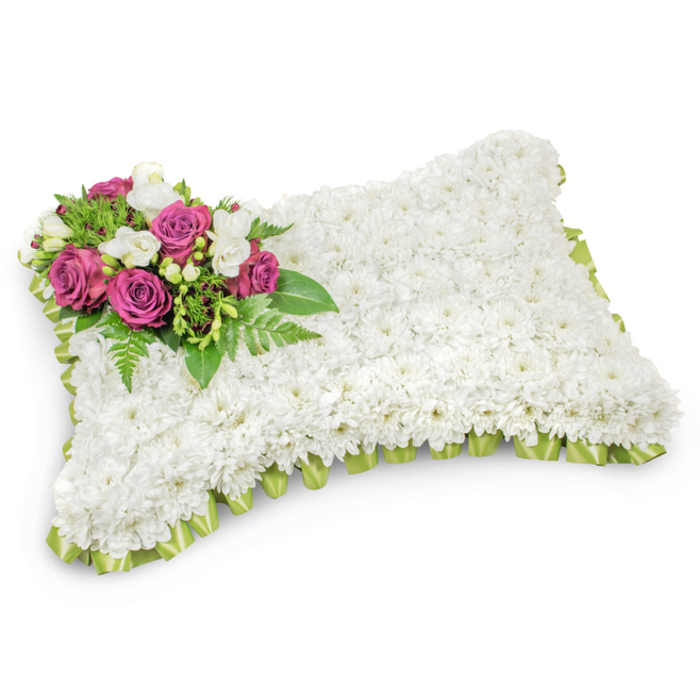 This beautiful arrangement of white chrysanthemums perfectly decorated with roses, freesia and dianthus is a lovely way to express your love, respect and sympathies in times of mourning. When I buy funeral flowers, am usually very detailed. From the type of flowers, the number and the colours in an arrangement, everything has to fit my specifications. This is the only florist that has been able to meet my requirements. A colleague at work lost her mum and in her grief stricken state, she could not figure out which florist to work with. The flowers we ordered from Handy Flowers did lighten her load greatly. My late niece loved chrysanthemums. We figured it was an excellent idea to use such as her funeral flowers. The company delivered the tribute really quickly. The arrangement to form her name is what melt my heart. Tried to order through the website but my internet connection was so bad that I couldn't finish the order. Called the team and they took all of my details over the phone. Fast, easy and convenient. Very elegant arrangement, very suitable for the sad occasion. Thanks for your kind words and professional service Handy Flowers! A beautiful funeral tribute. Amazed at the fresh flowers and the gorgeous display!